vegetable stew recipe | veg stew | how to make kerala style vegetable stew with detailed photo and video recipe. popular vegetables based curry from kerala which is also known as ishtu. 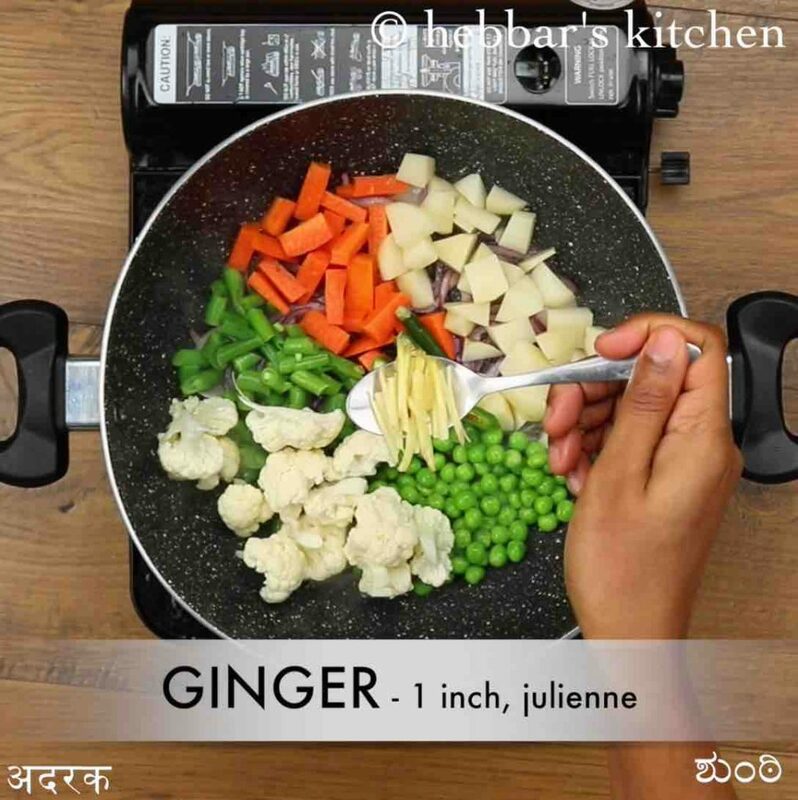 basically, a combination of vegetable creamy curry prepared with thick and thin coconut milk and dry spices. it is generally served with flaky malabar parotta or appam, but also popularly served with idiyappam and ghee rice. vegetable stew recipe | veg stew | how to make kerala style vegetable stew with step by step photo and video recipe. kerala cuisine is famous for it coastal and seafood recipes which are predominately prepared with coconut flavour. the recipes are generally prepared with freshly grated coconut masala or with coconut milk. 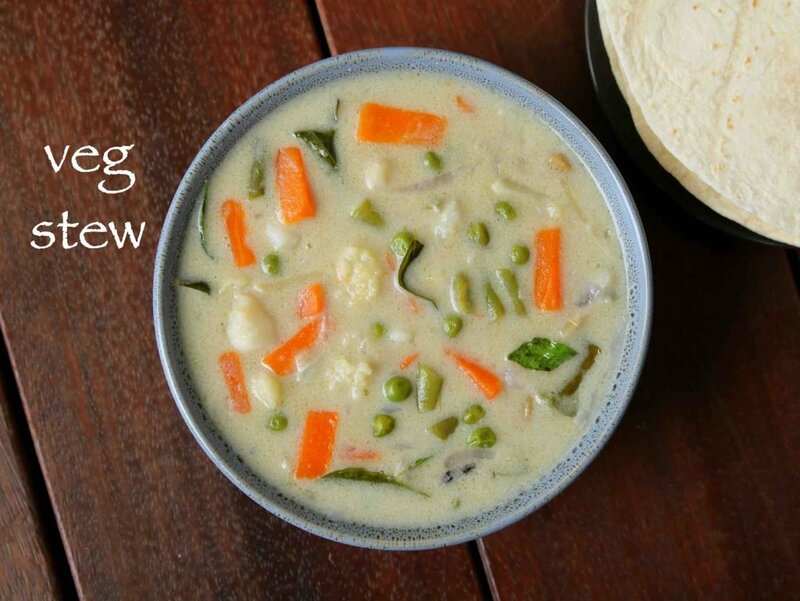 one such popular creamy kerala style curry is a vegetable stew with choice veggies. i have and always will be a huge fan of malabar parotta and veg kurma combination. as a matter of fact, it is one of the delicacies and a popular snack in udupi and mangalore region. 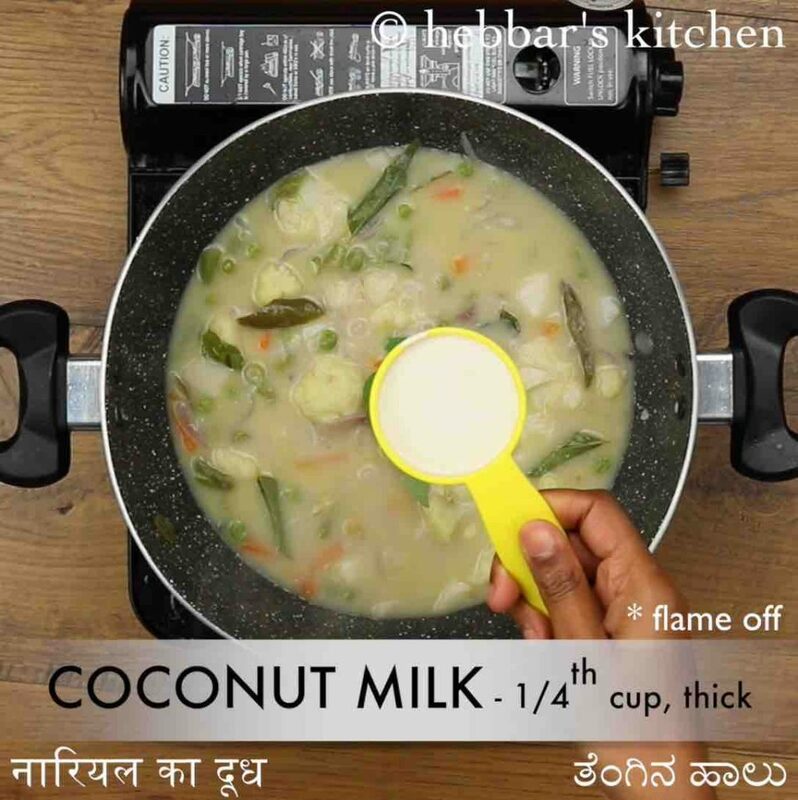 the reason i am highlighting this because veg kurma is very similar to veg stew recipe and the main difference i can see is the usage of coconut masala vs coconut milk. in other words, kurma is made with freshly grated green coloured coconut masala with coriander, chilies and dry spices. whereas, in the vegetable stew recipe, coconut extract or milk is added on top of the curry. the milk provides more creaminess to the curry as compared to former and that is main reason i prefer kurma recipe rather than stew recipe. but that is my personal choice and many prefer creamy way especially in kerala. furthermore, i would like to highlight few tips and variation to this creamy vegetable stew recipe. firstly, the coconut milk can be either freshly prepared at home by grinding coconut or you can store bought coconut cream. i have used the store bought coconut cream can and i have added water to make it less creamy. secondly, adding vegetables is completely open-ended and you can explore it with your choice. apart from the veggies i have added, you can add brocolli, snow pea, tindora, yam and beetroot etc. lastly, some prefer red coloured veg stew recipe, and to achieve the same you can add turmeric and chilli powder while sauteing the veggies. make sure to skip the green chillies if you are adding red chilli powder. 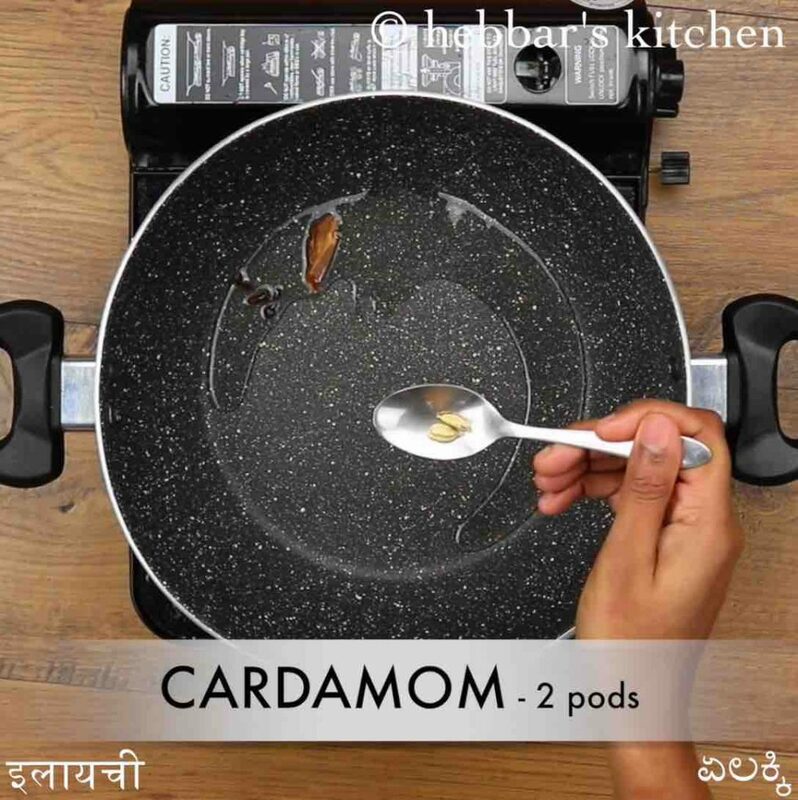 firstly, in a large kadai heat ½ tbsp coconut oil and saute 2 cloves, 1 inch cinnamon and 2 pods cardamom. further, add ½ onion and saute till they shrink slightly. do not brown the onions. 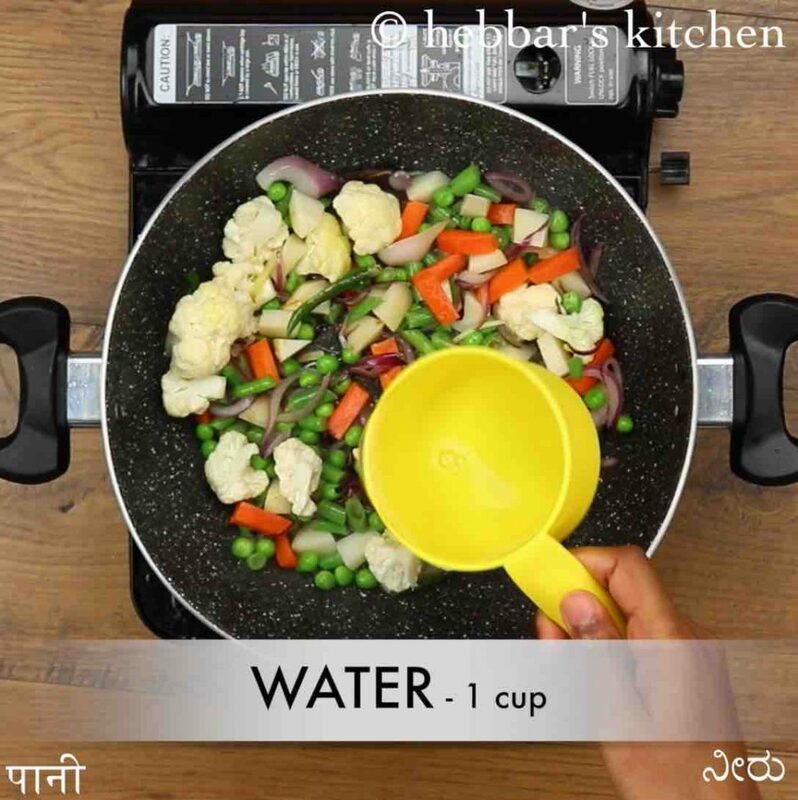 also add 5 beans, ½ carrot, ½ potato, 3 tbsp peas, 10 florets cauliflower, 2 green chilli and 1 inch ginger. furthermore, add 1 cup water, 1 tsp salt and few curry leaves. mix well. 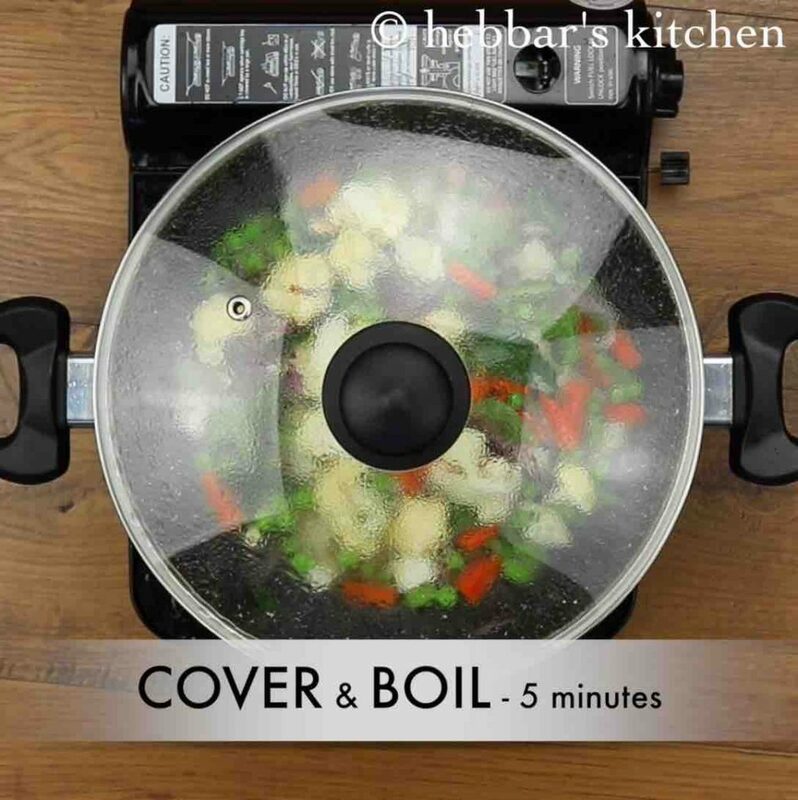 cover and boil for 5 minutes or till vegetables are half cooked. now add 2 cup coconut milk (thin consistency) and mix well. 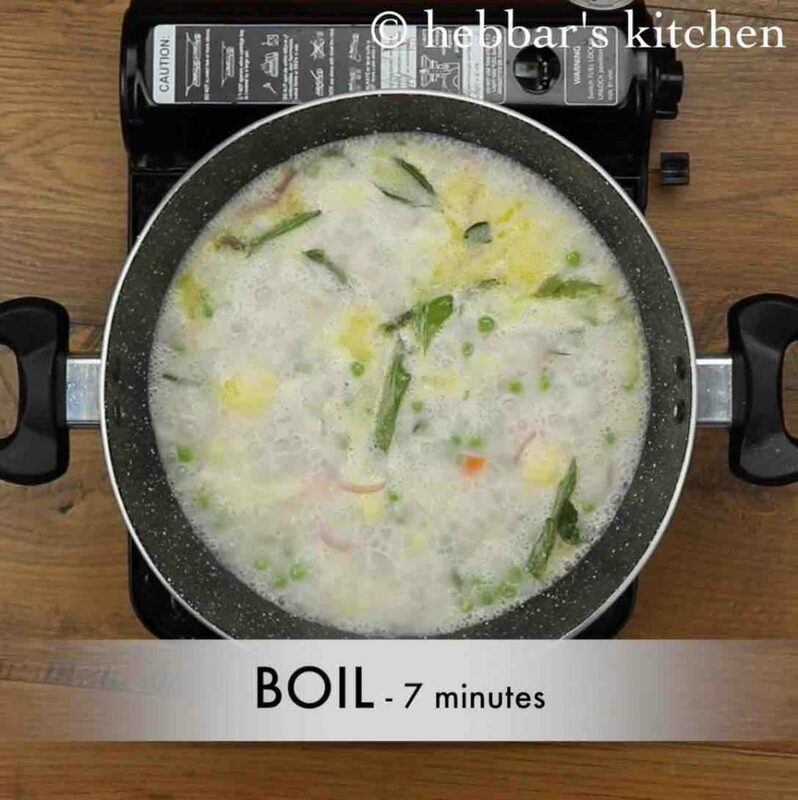 boil for 7 minutes or till vegetables is cooked completely. turn off the flame and add few curry leaves, ¼ cup thick coconut milk and 1 tsp coconut oil. mix well. 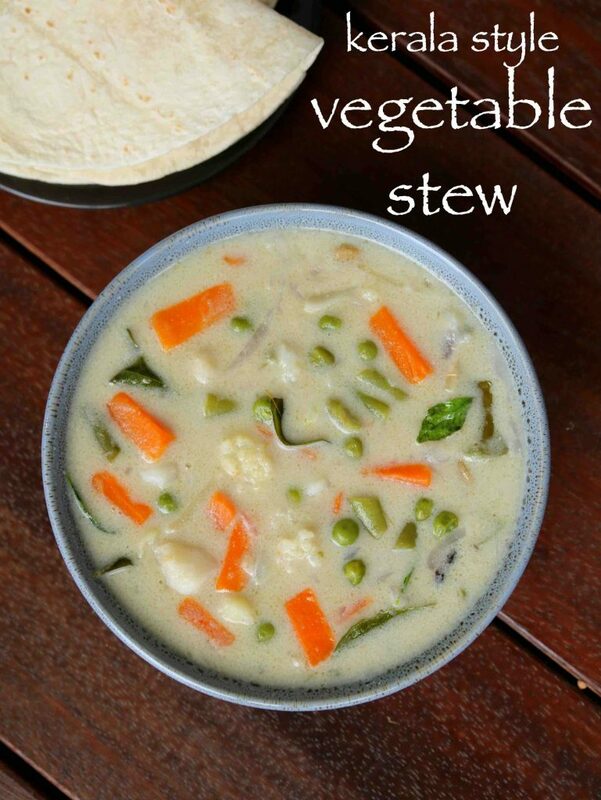 finally, serve kerala style vegetable stew with idiyappam or appam. 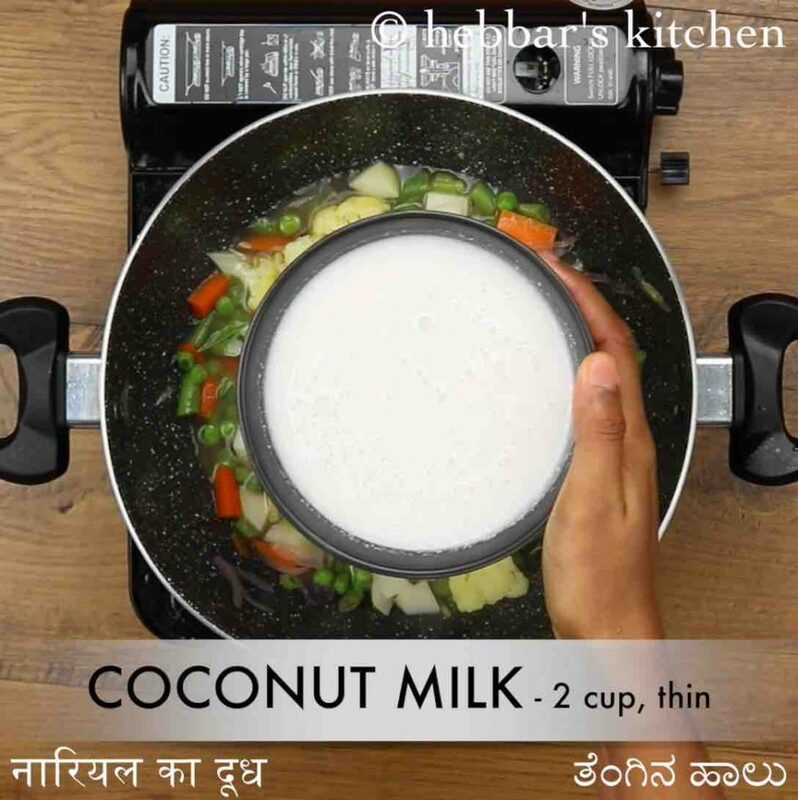 firstly, use thin consistency coconut milk while cooking vegetables. also, add ¼ cup thick coconut milk after turning off the flame, else the coconut milk might curdle. additionally, for thicker and creamy consistency use 3 tbsp of cashew paste / poppy seeds paste. 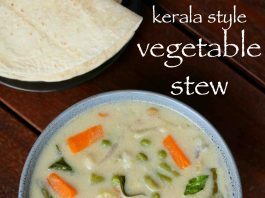 finally, kerala style vegetable stew recipe tastes great when prepared with a variety of vegetables.